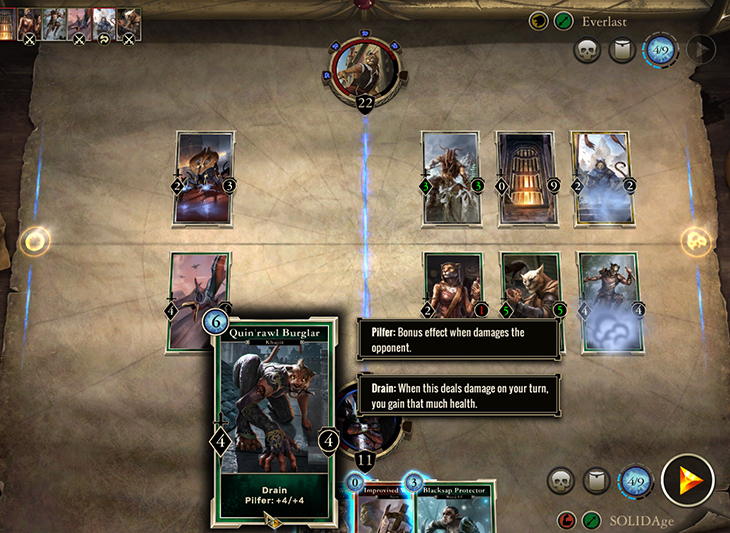 The Elder Scrolls: Legends puts a very unique spin on your traditional digital card game. Fast-paced and accessible, Legends also has a lot of depth for experienced player to explore. But before we dive into the strategic nuances of deck-building or the innovative dual-lane setup, let’s begin with the basics: how to play a match. As you can imagine, creatures are the bread and butter of The Elder Scrolls: Legends. Each creature has both an attack and defense value; these are the most relevant factors during combat. When one creature attacks another, their attack and defense stats trade. As an example, let’s say I have a creature with attack value of 4, and I used it to attack one of your creatures that has a defense value of 3. When this happens, your creature will die, leaving play and shuffling off this digital mortal coil. (How very unfortunate… for you, that is.) But all is not lost! Your creature will also attack my creature’s defense. If your creature’s attack value is large enough, mine will die too. If not, you’ll weaken one of my creatures, and perhaps remove it in a later turn. Creatures in Legends are not restricted to only attacking other creatures, however. They also have the option of attacking the opponent directly – as long as there are no creatures with Guard in the same lane as the attacking creatures. (When a creature has Guard, all enemy creatures in its lane must attack it before they can go after the player or other cards on the play mat. We’ll explore other abilities like Guard in another feature.) One thing to note is that creatures cannot typically attack during the turn they come into play; there is an exception to this rule, which we’ll discuss later. There are 12 different keyword abilities a creature can have in The Elder Scrolls: Legends. Some are static effects that last for the duration of a creature's life, while others are one-time effects that trigger at certain moments. The different abilities include: Prophecy, Breakthrough, Guard, Regenerate, Charge, Ward, Shackle, Lethal, Pilfer, Last Gasp, Summon and Drain. Abilities play a major role in your game and your deck-building. We’ll delve into these in another feature but, needless to say, abilities can have a sizable impact on combat. If creatures are the chess pieces of Legends, then lanes are the squares on the board. All competitive matches and most of the campaign matches include two lanes. Creatures can be deployed to whichever lane you choose, but they can only directly attack opposing creatures in the same lane (unless otherwise stated). This adds a lot of strategic depth to the game. If your opponent has a huge monster in the right lane that will kill anything you deploy, you may want to play your creature in the left lane and avoid it until you can properly deal with it. If you know your opponent has a spell that will deal damage to all creatures in a single lane, spread out your forces to mitigate the damage dealt. Though creatures can’t be directly attacked by another creature outside of their lane, they can be affected by any special Summons another creature might have. If you place an Ash Servant in one lane, you can use his Summon to deal two damage to any creature on the board, even if they have Cover. Some lanes have stipulations that are noted at the beginning of the match. The most common is the “Shadow” lane, which dictates that creatures played into this lane start with the Cover modifier (meaning they cannot be attacked for a full turn after coming into play). In addition to the normal lane, there are many different modified lane types. We’ll also explore these in a later feature, but you should be aware of their impact on combat. Each of these modified lane types affects the game in a different way. 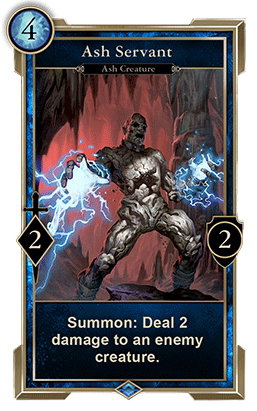 Combat is the backbone of The Elder Scrolls: Legends. In time you will learn the ins and outs of the game’s unique combat system and how you can make them work to your advantage. One key concept to grasp is that of initiative. When your board state is ahead – meaning you have more creatures in play than your opponent and are in a generally more favorable position – you have the initiative. In this situation your best bet (usually, but not always) is to attack your opponent directly rather than dealing with their creatures. The reason is that the opponent’s creatures will typically have to retaliate on their turn by killing your creatures to stem the bleeding. In short, make them do the work of clearing out your creatures while you deal direct damage to your foe. Advantages like this can be found throughout Legends. We’ll share a lot more tips and tactics in the near future, so stay tuned for more strategic articles coming soon!